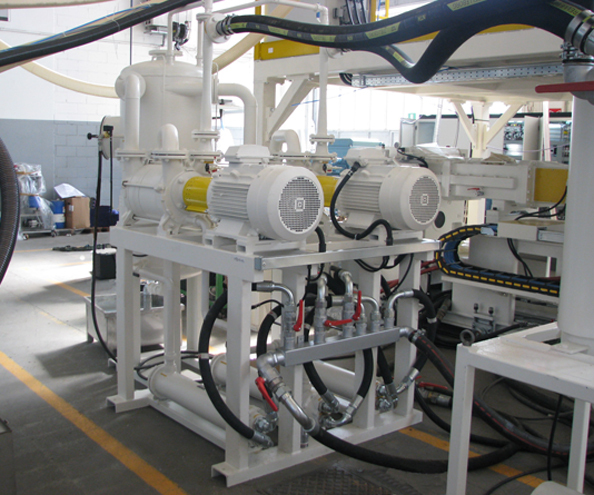 The HVTSE® system relies on high vacuum to dry and de-volatilize the material as it is being extruded. Liquid ring vacuum pumps are industry proven and very well suited for this application. These pumps are designed to operate efficiently in environments where highly saturated vapors or particles will be present while providing years of reliable service life. The co-rotating feed screws of the HVTSE® system does not operate fully flooded with material, thus creating the ability to draw high vacuum over a large surface area on each side of a proprietary polymer seal section. Additionally this system runs at elevated screw speeds (up to 300 rpm) such that the high vacuum region (dual vacuum vent zones creates high vacuum over a 20+ L/D section of the machine) is under a constant state of renewal creating a highly efficient means for drying and devolatizing the extrudate as it's being processed. The vacuum circuits operate at a nominal vacuum pressure of 35 mbar. However, a unique system circuit design provides the capability to produce vacuum levels as high as 12 mbar should the process require it. As with any vacuum decontamination system regular cleaning is required. Following a simple preventative maintenance schedule assures proper system function is maintained within the minimum amount of time and process interruption. 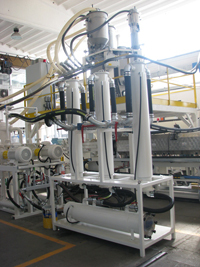 The unique system design avoids the use of consumable filters or screens as part of its robust platform. Extracted moisture is condensed and stored for easy removal and proper disposal on weekly intervals.